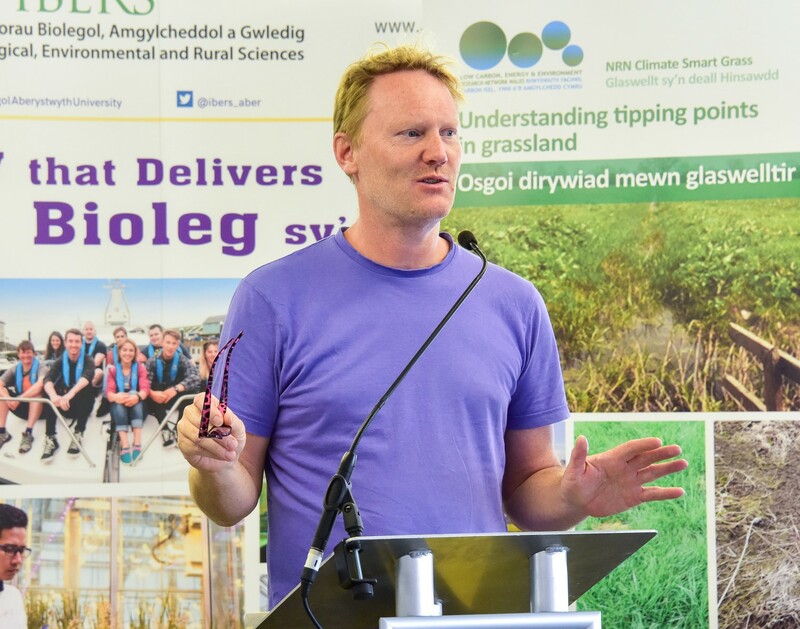 Davey Jones holds a Professorial Chair in Soil and Environmental Science at Bangor University. Previously, he was a Postdoctoral Research Fellow held jointly between Cornell University and the US Department of Agriculture in the USA (with Prof Leon Kochian). He also carried out postdoctoral work under Prof Simon Gilroy at Penn State University. A major focus of his research is on understanding below-ground processes with specific focus on nutrients and human pathogen behavior in soil-plant-microbial systems. Current applications of his work include (1) the implementation of strategies for controlling E. coli O157 and viral pathogens in agricultural, freshwater and marine ecosystems, (2) promoting carbon sequestration in agricultural systems and understanding the factors regulating carbon cycling and greenhouse gas emissions, (3) developing ways to improve nutrient use efficiency in cropping systems with specific focus on nitrogen and phosphorus, (4) nutrient dynamics in polar (Arctic and Antarctic ecosystems), (5) devising strategies for the effective reuse of wastes for land restoration and remediation (heavy metals and organic pollutants), (6) soil microbial diversity and ecosystem functioning, (7) modelling nutrients dynamics in the plant-soil-microbial and freshwater ecosystems, (8) understanding the barriers to technology adoption by farmers, (9) the flow of endocrine disrupting chemicals in the environment, and (10) the impact of flooding, drought and ozone on ecosystem functioning (including tipping points) and potential strategies to enhance ecosystem resilience. He has published more than 400 scientific journal articles (H-index = 65; 18,100 citations) and has advised government on both their waste and climate change policies. His research is mainly funded via NERC, BBSRC, Welsh Government, Defra and the European Union. If you would like to undertake a PhD in my research group then just Email me at d.jones@bangor.ac.uk. If a subject that you are interested in is not on the list then please contact me. Our aim if for all PhD students to publish their thesis as a series of scientific papers in international journals. My list of PhD students have included those from China, Pakistan, Nepal, Costa Rica, Brazil, Zambia, Mexico, Iran, Iraq, Nepal, India, Malaysia, Australia, Austria, Spain, Italy, Sweden, Russia, Germany, Thailand, Saudi Arabia and the UK. Plant-soil-microbe interactions, Environmental Pollution, Human Pathogens, Dissolved Organic Nitrogen, Soil Quality, Freshwater pollution, Crop Science, Greenhouse Gas Emissions, Agronomy and Modelling. Robins, P, Farkas, K, Jones, DL, Cooper, D & Malham, S 2019, 'Viral dispersal in the coastal zone: a method to quantify water quality risk', Environment International, vol. 126, pp. 430-442. Wiik, E, Jones, DL, Chadwick, D, Hill, P, Sanchez Rodriguez, A, Dodd, R, Turner, R, Kingston-Smith, A, Gwynn-Jones, D, Doonan, J, Scullion, J, Loka, D, Hayes, F, Robinson, D & Toberman, H 2019, Science to Policy: Climate-proofing grassland productivity. Science to Policy, Ser Cymru National Research Network for Low Carbon, Energy and Environment. Farkas, K, Adriaenssens, EM, Walker, DI, McDonald, J, Malham, S & Jones, DL 2019, 'Critical Evaluation of CrAssphage as a Molecular Marker for Human-Derived Wastewater Contamination in the Aquatic Environment', Food and Environmental Virology, pp. 1-7. Plant-microbe competition: does injection of isotopes of C and N into the rhizosphere effectively characterise plant use of soil N? Jones, D, Olivera-Ardid, S, Klumpp, E, Hill, P, Lehndorff, E & Bol, R 2018, 'Moisture activation and carbon use efficiency of soil microbial communities along an aridity gradient in the Atacama Desert', Soil Biology and Biochemistry, vol. 117, pp. 68-71. Carswell, AM, Hill, P, Jones, D, Blackwell, MSA, Johnes, PJ, Chadwick, D & Dixon, ER 2018, 'Impact of microbial activity on the leaching of soluble N forms in soil', Biology and Fertility of Soils, vol. 54, no. 1, pp. 21-25. George, P, Keith, AM, Creer, S, Barrett, GL, Lebron, I, Emmett, BA, Robinson, D & Jones, D 2017, 'Evaluation of mesofauna communities as soil quality indicators in a national-level monitoring programme', Soil Biology and Biochemistry, vol. 115, pp. 537-546. Hill, P, Jones, D & Chadwick, D 2017, 'Crop residues exacerbate the negative effects of extreme flooding on soil quality', Biology and Fertility of Soils. Cheng, H, Hill, P, Bastami, MS & Jones, D 2017, 'Biochar stimulates the decomposition of simple organic matter and suppresses the decomposition of complex organic matter in sandy loam soil', GCB Bioenergy, pp. 1110-1121. Jones, D 2017, 'Rice rhizodeposition and carbon stabilisation in paddy soil are regulated via drying-rewetting cycles and nitrogen fertilisation', Biology and Fertility of Soils, vol. 53, no. 4, pp. 407. Jones, D, Freeman, C & Sánchez-Rodríguez, AR 2017, Waste Water Treatment. in B Thomas, BG Murray & DJ Murphy (eds), Encyclopedia of Applied Plant Sciences. 2 edn, vol. 3, Elsevier, pp. 352. Curling, S, Jones, D, Ormondroyd, G & Williams, A 2017, 'Effectiveness of a wool based packaging system on the abundance of surface spoilage microorganisms on meat products', Arab Gulf Journal of Scientific Research, vol. 34, no. 2/3. Struvite: a slow-release fertiliser for sustainable phosphorus management? Do Effective Micro-Organisms Affect Greenhouse Gas Emissions from Slurry Crusts? Bastami, MSB, Chadwick, D & Jones, D 2016, 'Do Effective Micro-Organisms Affect Greenhouse Gas Emissions from Slurry Crusts? ', Journal of Advanced Agricultural Technologies, vol. 3, no. 1. Experimental evidence for drought induced alternative stable states of soil moisture. The urine patch diffusional area: An important N2O source? Can macrophyte harvesting from eutrophic water close the loop on nutrient loss from agricultural land? Ali, K, Arif, M, Jan, MT, Khan, MJ & Jones, DL 2015, 'Integrated use of Biochar: A tool for improving soil and wheat quality of degraded soil under wheat-maiza cropping pattern', Pakistan Journal of Botany, vol. 47, no. 1, pp. 233-240. Does biochar application alter heavy metal dynamics in agricultural soil? Exposure to nitrogen does not eliminate N-2 fixation in the feather moss Pleurozium schreberi (Brid.) Mitt. How significant to plant N nutrition is the direct consumption of soil microbes by roots? Rapid peptide metabolism: A major component of soil nitrogen cycling? Seasonal variation in soluble soil carbon and nitrogen across a grassland productivity gradient. The environmental and biosecurity characteristics of livestock carcass disposal methods: a review. Vascular plant success in a warming Antarctic may be due to efficient nitrogen acquisition. Alleviation of both water and nutrient limitations is necessary to accelerate ecological restoration of waste rock tips. Can a mesotropic grassland community be restored on a post-industrial sandy site with compost made from waste materials? Estimating the component of soil respiration not dependent on living plant roots: comparison of the indirect y-intercept regression approach and direct bare plot approach. How do draining and re-wetting affect carbon stores and greenhouse gas fluxes in peat soils? Bussell, J, Jones, DL, Healey, JR & Pullin, AS 2010, How do draining and re-wetting affect carbon stores and greenhouse gas fluxes in peat soils?. The Collaboration for Environmental Evidence. Rangecroft, S, DeLuca, T, Emmett, B & Jones, D 2010, 'Greenhouse gas sink or health risk? Assessing the fate of polycyclic aromatic hydrocarbons (PAHs) in biochar within the plant-soil system', Abstracts of papers - American Chemical Society, vol. 240. Food waste composting: Its use as a peat replacement. Fate of prions in soil: degradation of recombinant prion in aqueous extracts from soil and casts of two earthworm species. Fungal root endophytes of the carnivorous plant Drosera rotundifolia. Microbiological quality of chicken wings damaged on the farm or in the processing plant. Dynamics of nitrogen speciation in horticultural soils in suburbs of Shanghai, China. Effect of the earthworms lumbricus terrestris and Aporrectodea caliginosa on bacterial diversity in soil. Use of composts in the remediation of heavy metal contaminated soil. Modification of fertility of soil materials for restoration of acid grassland habitat. Microbial diversity and activity are increased by compost amendment of metal-contaminated soil. Migration of heavy metals in soil as influenced by compost amendments. Bussell, J, Jones, D, Healey, J & Pullin, A 2010, 'How do draining and re-wetting affect carbon stores and greenhouse gas fluxes in peat soils? Systematic Review', Environmental Evidence. In situ mapping of nutrient uptake in the rhizosphere using nanoscale secondary ion mass spectrometry. Critical evaluation of municipal solid waste composting and potential compost markets. Despite high uptake efficiency, non-mycorrhizal Rumex acetosella increases available phosphorous in the rhizosphere soil, whereas Viscaria vulgaris, Plantago lanceolata and Achillea millefolium does not. Heavy metal contamination of a mixed waste compost: metal speciation and fate. Amino acids as a nitrogen source for tomato seedlings: the use of dual-labeled (13C, 15N) glycine to test for direct uptake by tomato seedlings. Heavy metal fractionation during the co-composting of biosolids, deinking paper fibre and green waste. Substrate mineralization studies in the laboratory show different microbial C partitioning dynamics than in the field. Carbon flow in the rhizosphere: carbon trading at the soil-root interface. Vegetation cover regulates the quantity, quality and temporal dynamics of dissolved organic carbon and nitrogen in Antarctic soils. Contaminated land clean-up using composted wastes and impacts of VOCs on land. Bioremediation of Poly-Aromatic Hydrocarbon (PAH)-Contaminated Soil by Composting. Geographical variation in carbon dioxide fluxes from soils in agro-ecosystems and its implications for life-cycle assessment. Organic acid mediated nutrient extraction efficiency in three calcareous soils. Soil organic nitrogen mineralization across a global latitudinal gradient. Interactive effects of organic acids in the rhizosphere. Remediation of metal polluted mine soil with compost: Co-composting versus incorporation. Resilience of soil microbial activity and of amino acid dynamics to the removal of plant carbon inputs during winter. Urine enhances the leaching and persistence of estrogens in soils. Assessing the addition of mineral processing waste to green waste-derived compost: an agronomic, environmental and economic appraisal. Dissolved organic carbon and nitrogen dynamics in temperate coniferous forest plantations. Williams, AP, Gordon, H, Jones, DL, Strachan, NJ, Avery, LM & Killham, K 2008, 'Leaching of bioluminescent Escherichia coli O157:H7 from sheep and cattle faeces during simulated rainstorm events', Journal of Applied Microbiology, vol. 105, no. 5, pp. 1452-1460. Optimisation of the anaerobic digestion of agricultural resources. Regulation of amino acid biodegradation in soil as affected by depth. Turnover of low molecular weight dissolved organic C (DOC) and microbial C exhibit different temperature sensitivities in Arctic tundra soils. Critical evaluation of methods for determining protein in soil solution. Deinking paper fibre application to agricultural land: soil quality enhancer or copper polluter? Decoupling of microbial glucose uptake and mineralization in soil. Survival of Escherichia coli, O157 : H7 in waters from lakes, rivers, puddles and animal-drinking troughs. Williams, AP, Edwards-Jones, G & Jones, DL 2008, Bioreduction of fallen stock – An evaluation of in-vessel bioreduction for containment of sheep prior to disposal: Final report. 2008 edn, Unknown. Dissolved organic nitrogen and mechanisms of its uptake by plants in agricultural systems. Jones, DL, Farrar, JF, Macdonald, AJ, Kemmitt, SJ, Murphy, DV, Ma, L (ed. ), Ahuja, LR (ed.) & Bruulsema, T (ed.) 2008, Dissolved organic nitrogen and mechanisms of its uptake by plants in agricultural systems. in Quantifying and Understanding Plant Nitrogen Uptake for Systems Modeling. 2008 edn, CRC Press, pp. 95-126. Bussell, JA, Jones, DL, Healey, JR & Pullin, AS 2008, 'How do draining and re-wetting affect carbon stores and greenhouse gas fluxes in peat soils?' Paper presented at Moors for the Future Annual Meeting – Living Upland Landscapes, Loosehill Hall, Peak District, 3/01/01, . Free amino sugar reactions in soil in relation to soil carbon and nitrogen cycling. Roberts, P, Edwards-Jones, G & Jones, DL 2007, 'Yield responses of wheat (Triticum aestivum) to vermicompost applications', Compost Science and Utilization, vol. 15, no. 1, pp. 6-15. In-vessel co-composting of green waste with biosolids and paper waste. Roberts, P, Edwards-Jones, G & Jones, DL 2007, 'In-vessel co-composting of green waste with biosolids and paper waste. ', Compost Science and Utilization, vol. 15, no. 4, pp. 272-282. In-vessel cocomposting of green waste with biosolids and paper waste. Roberts, P, Edwards-Jones, G & Jones, DL 2007, 'In-vessel cocomposting of green waste with biosolids and paper waste. ', Compost Science and Utilization, vol. 15, no. 4, pp. 272-282. Dynamics of size-density fractions of soil organic matter following the addition of tree litter to organic coffee farms. Yield and vitamin C content of tomatoes grown in vermicomposted wastes. Microbial response time to sugar and amino acid additions to soil. Roberts, P, Edwards, CA, Edwards-Jones, G & Jones, DL 2007, 'Responses of common pot grown flower species to commercial plant growth media substituted with vermicomposts', Compost Science and Utilization, vol. 15, no. 3, pp. 159-166. Responses of pot-grown flower species to commercial plant media substituted with vermicompost. Roberts, P, Edwards, CA, Edwards-Jones, G & Jones, DL 2007, 'Responses of pot-grown flower species to commercial plant media substituted with vermicompost. ', Compost Science and Utilization, vol. 15, no. 3, pp. 159-166. Phosphatase activity does not limit the microbial use of low molecular weight organic-P substrates in soil. Fast turnover of low molecular weight components of the dissolved organic carbon pool of temperate grassland field soils. Persistence, dissipation, and activity of Escherichia coli O157:H7 within sand and seawater environments. Survival of Escherichia coli O157:H7 in the rhizosphere of maize grown in waste-amended soil. Grassland plants affect dissolved organic carbon and nitrogen dynamics in soil. Root exudate components change litter decomposition in a simulated rhizosphere depending on temperature. Nason, MA, Williamson, J, Tandy, S, Christou, M, Jones, DL & Healey, JR 2007, Using organic wastes and composts to remediate and restore land: best practice manual. Unknown. Earthworms as vectors of Escherichia coli O157:H7 in soil and vermicomposts. Fertilizer application during primary succession changes the structure of plant and herbivore communities. Walmsley, JD, Jones, DL & Healey, JR 2006, 'Overview of Biomass Energy in Wales, UK' Paper presented at Proceedings of second RecAsh International Seminar, Karlstad, Sweden, 26 – 28 September 2006., 3/01/01, . Walmsley, JD, Jones, DL & Healey, JR 2006, 'Recycling of Wood Ash to Forests in the UK' Paper presented at RecAsh 2nd International Seminar, Karlstad, Sweden, 3/01/01, . Pitman, R, Walmsley, JD, Healey, JR & Jones, DA 2006, 'Recycling of Wood Ash to Forests: Application to PAWS Sites' Paper presented at RecAsh 2nd International Seminar, Karlstad, Sweden, 3/01/01, . Pitman, R, Walmsley, JD, Healey, JR & Jones, DL 2006, 'Recycling of Wood Ash to Forests: Application to PAWS Sites' Paper presented at Ecological Restoration of Conifer Forests: Research and Applications, British Ecological Society Forest Ecology Group, University of Wales, Bangor, Wales, UK, 3/01/01, . Behaviour of the endocrine-disrupting chemical nonylphenol in soil: assessing the risk associated with spreading contaminated waste to land. Spatial coordination of aluminium uptake, production of reactive oxygen species, callose production and wall rigidification in maize roots. Recycling of wood ash to forests in North Wales, UK. Walmsley, JD, Healey, JR & Jones, DL 2006, 'Recycling of wood ash to forests in North Wales, UK.' Paper presented at Proceedings of Second World Bioenergy Conference, Sweden, 3/01/01, pp. 347-351. Walmsley, JD, Healey, JR & Jones, DL 2006, 'Recycling of wood ash to forests in North Wales, UK.' Paper presented at Proceedings of Second World Bioenergy Conference, 30 May-1 June 2006, Jönköping, Sweden., 3/01/01, pp. 347-351. Walmsley, JD, Healey, JR & Jones, DL 2006, 'Recycling of wood ash to forests in North Wales, UK' Paper presented at Second World Bioenergy Conference, Jönköping, Sweden, 3/01/01, . pH regulation of carbon and nitrogen dynamics in two agricultural soils. Williamson, JC, Holmberg, J, Nason, MA, Tandy, S, Jones, R, Healey, JR & Jones, DL 2006, 'Pathogen survival patterns in waste-derived composts destined for land restoration' Paper presented at Proceedings of Waste 2006: sustainable waste and resource management, Stratford upon Avon, Warwickshire, 3/01/01, pp. 733-738. Williamson, JC, Holmberg, J, Nason, MA, Tandy, S, Jones, R, Healey, JR, Jones, DL, Vegh, B (ed.) & Royle, J (ed.) 2006, Pathogen survival patterns in waste-derived composts destined for land restoration. in Proceedings of Waste 2006: sustainable waste and resource management, Stratford-upon-Avon, Warwickshire. 2006 edn, The Waste Conference Limited, pp. 733-738. Nason, MA, Tandy, S, Williamson, JC, Farrell, M, Healey, JR, Jones, DL, Vegh, B (ed.) & Royle, J (ed.) 2006, Physical and chemical characteristics of composted wastes can be altered to make them suitable for large scale habitat creation. in Proceedings of Waste 2006: sustainable waste and resource management, Stratford-upon-Avon, Warwickshire. 2006 edn, The Waste Conference Limited, pp. 739-744. Walmsley, JD, Healey, JR & Jones, DL 2006, Recycling of wood ash to forests in North Wales, UK. in Proceedings of Second World Bioenergy Conference, 30 May-1 June 2006, Jönköping, Sweden. 2006 edn, Swedish Bioenergy Association, pp. 347-351. Oxalate and ferricrocin exudation by the extramatrical mycelium of an ectomycorrhizal fungus in symbiosis with Pinus sylvestris. Organic acid behaviour in a calcareous soil: implications for rhizosphere nutrient cycling. Interference by amino acids during the determination of N-15 ammonium in soil. Dissolved organic nitrogen in contrasting agricultural ecosystems. Rapid intrinsic rates of amino acid biodegradation in soils are unaffected by agricultural management strategy. Organic acid concentrations in soil solution: effects of young coniferous trees and ectomycorrhizal fungi. Dissolved organic nitrogen uptake by plants - an important N uptake pathway? Modelling low molecular weight organic acid dynamics in forest soils. Persistence of Escherichia coli O157 on farm surfaces under different environmental conditions. Survival of E. coli O157:H7 in organic wastes destined for land application. Carbon sequestration: Do N inputs and elevated atmospheric CO2 alter soil solution chemistry and respiratory C losses? Escherichia coli O157 survival following the surface and sub-surface application of human pathogen contaminated organic waste to soil. Rapid amino acid cycling in arctic and antarctic soils. Cytological and enzymatic responses to aluminium stress in root tips of Norway spruce seedlings. Plant and mycorrhizal regulation of rhizodeposition. Bacterioplankton production in freshwater Antarctic lakes. Mobilization of aluminium, iron and silicon by Picea abies and ectomycorrhizas in a forest soil. Aluminium complexation suppresses citrate uptake by acid forest soil microorganisms. Temporal dynamics of carbon partitioning and rhizodeposition in wheat. Dissolved organic nitrogen concentration in two grassland soils. Jones, DL, Farrar, JF, Willett, VB, Hatch, DJ (ed. ), Chadwick, DR, Jarvis, SC & Roker, JA (ed.) 2004, Dissolved organic nitrogen concentration in two grassland soils. in Controlling Nitrogen Flows and Losses. 2004 edn, Wageningen Academic Publishers, pp. 441-443. Dissolved organic nitrogen regulation in freshwaters. Willett, VB, Reynolds, BA, Stevens, PA, Ormerod, SJ & Jones, DL 2004, 'Dissolved organic nitrogen regulation in freshwaters. ', Journal of Environmental Quality, vol. 33, no. 1, pp. 201-209. Murphy, DV, Stockdale, EA, Hoyle, FC, Smith, JU, Fillery, IR, Milton, N, Cookson, WR, Brussaard, L, Jones, DL, Hatch, DJ (ed. ), Chadwick, DR, Jarvis, SC & Roker, JA (ed.) 2004, Matching supply with demand. in Controlling nitrogen flows and losses. 2004 edn, Wageningen Academic Publishers, pp. 101-112. Missing N: is the solution in dissolved N? Macdonald, AJ, Jones, DL, Hatch, DJ (ed. ), Chadwick, DR, Jarvis, SC (ed.) & Roker, JA (ed.) 2004, Missing N: is the solution in dissolved N? in Controlling nitrogen flows and losses. 2004 edn, Wageningen Academic Publishers, pp. 600-605. Low molecular weight organic acid adsorption in forest soils: effects on soil solution concentrations and biodegradation rates. Biodegradation of low molecular weight organic acids in a limed forest soil. Effects of acidification and its mitigation with lime and wood ash on forest soil processes in southern Sweden: a joint multidisciplinary study. A stable bioluminescent construct of Escherichia coli O157:H7 for hazard assessments of long-term survival in the environment. Jones, DL, Ryan, PR, Thomas, B (ed. ), Murphy, D (ed.) & Murray, B (ed.) 2003, Aluminium toxicity. in Encyclopaedia of applied plant science. 2003 edn, Academic Press, pp. 656-664. Associative nitrogen fixation and root exudation - What is theoretically possible in the rhizosphere? Jones, DL, Farrar, JF & Giller, KE 2003, 'Associative nitrogen fixation and root exudation - What is theoretically possible in the rhizosphere? ', Symbiosis, vol. 35, no. 1-3, pp. 19-38. Organic acid behavior in soils: misconceptions and knowledge gaps. Jones, DL, Rowe, EC, Thomas, B (ed. ), Murphy, D (ed.) & Murray, B (ed.) 2003, Plants and the environment: land reclamation and remediation: Principles and practice. in Encyclopaedia of applied plant science. 2003 edn, Academic Press, pp. 741-748. Williamson, JC, Rowe, EC, Rendell, T, Healey, JR, Jones, DL, Holliman, PJ & Nason, MA 2003, Restoring habitats of high conservation value after quarrying: best practice manual. University of Wales, Bangor, Institute of Environmental Science. Rhizosphere methods in agroforestry research. Jones, DL, Schroth, G (ed.) & Sinclair, F 2003, Rhizosphere methods in agroforestry research. in Trees: crops and soil fertility: concepts and research methods. 2003 edn, CAB International, pp. 289-301. Williamson, JC, Jones, DL, Rowe, EC, Healey, JR, Bardgett, R, Hobbs, P, Moore, HM (ed. ), Fox, HR (ed.) & Elliott, S (ed.) 2003, Soil functioning in natural and planted woodlands on slate waste. in Land reclamation. 2003 edn, Swets & Zeitlinger, pp. 315-318. Williamson, JC, Jones, DL, Rowe, EC, Healey, JR, Bardgett, R, Hobbs, P, Moore, HM (ed. ), Fox, HR (ed.) & Elliott, S (ed.) 2003, Soil functioning in natural and planted woodlands on slate waste. in Land Reclamation: Extending the Boundaries. 2003 edn, Taylor & Francis, pp. 315-318. The control of carbon acquisition by and growth of roots. Farrar, JF, Jones, DL, De Kroon, H (ed.) & Visser, EJ (ed.) 2003, The control of carbon acquisition by and growth of roots. in Root Ecology. 2003 edn, Springer-Verlag Berlin and Heidelberg GmbH, pp. 91-124. Jones, DL, Freeman, C, Thomas, B (ed. ), Murphy, D (ed.) & Murray, B (ed.) 2003, Waste water treatment. in Encyclopaedia of applied plant science. 2003 edn, Academic Press, pp. 772-781. Biodegradation of low molecular weight organic acids in coniferous forest podzolic soils. Williamson, JC, Rowe, EC, Rendell, T, Healey, JR, Jones, DL, Holliman, PJ & Nason, MA 2002, 'Re-creating a woodland and heathland on slate waste in Wales' Paper presented at Reclamation with a purpose, Proceedings on the National Meeting of the American Society of Mining Reclamation, Kentucky, USA, 3/01/01, pp. 449-458. Organic acid mediated P mobilization in the rhizosphere and uptake by maize roots. Soil amino acid turnover dominates the nitrogen flux in permafrost-dominated taiga forest soils. Human enteric pathogens in the farming environment. Jones, DL, Campbell, G, Kaspar, CW, Haygarth, PM (ed.) & Jarvis, SC 2002, Human enteric pathogens in the farming environment. in Agriculture: hydrology and water quality. 2002 edn, CAB International, pp. 133-154. Williamson, JC, Rowe, EC, Healey, JR, Jones, DL, Holliman, PJ & Nason, MA 2002, 'Sustainable post-industrial land restoration and recreation of high biodiversity natural habitats' Paper presented at Conference of the International Association for Land Reclamation, Kentucky, USA, 3/01/01, . Nason, M, Farrar, JF, Healey, JF, Jones, DL, Williamson, JC & Rowe, EC 2001, 'Changes in water holding capacity of fine slate waste during decomposition of added plant litters' Paper presented at Annual meeting of British Ecological Society, University of Warwick, 3/01/01, . Soil functioning in natural and restored systems on slate waste. Williamson, JC, Jones, DL, Bardgett, RD, Hobbs, PJ, Rowe, EC, Nason, MA & Healey, JR 2001, 'Soil functioning in natural and restored systems on slate waste.' Paper presented at Annual meeting of British Ecological Society, University of Warwick, 3/01/01, . Water and nutrient limitations to tree establishment on slate waste. Rowe, EC, Williamson, JC, Jones, DL & Healey, JR 2001, 'Water and nutrient limitations to tree establishment on slate waste.' Paper presented at Annual meeting of British Ecological Society, University of Warwick, 3/01/01, . Organic acid behaviour in a calcareous soil: sorption reactions and biodegradation rates. Soil microbial community patterns that are related to the history and intensity of grazing in sub-montane ecosystems. Aluminium effects on organic acid mineralization in a Norway spruce forest soil. Control of amino acid mineralization and microbial metabolism by temperature. Function and mechanism of organic anion exudation from plant roots. Competition for amino acids between wheat roots and rhizosphere microorganisms and the role of amino acids in plant N acquisition. Strom, L, Godbold, DL & Jones, DL 2001, 'Procedure for determining the biodegradation of radiolabeled substrates in a calcareous soil', Soil Science Society of America Journal, vol. 65, no. 2, pp. 347-351. Kinetics of soil microbial uptake of free amino acids. Grundy, SP, Jones, DL, Godbold, DL, Horst, WW (ed. ), Sattelmacher, B (ed. ), Schmidhalter, U (ed. ), Schubert, S (ed. ), Von Wiren, N (ed. ), Wittenmayer, L (ed. ), Schenk, MK (ed. ), Burkert, A (ed. ), Claassen, N (ed.) & Flessa, H (ed.) 2001, Organic acid root-tip tissue concentration in Brachiaria decumbens and Brachiaria ruziziensis. in Plant nutrition - food security and sustainability of agro-ecosystems through applied and basic research.. 2001 edn, Kluwer Academic Publishers, pp. 506-507.